SSB is not just about your intellectual but more of a personality assessment test that does not expect you to give predetermined answers. 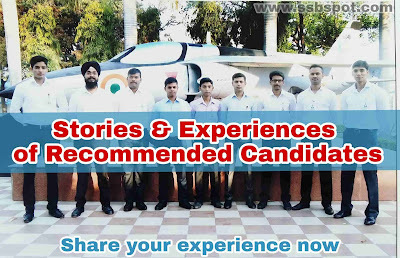 Candidates wonder what things they must do before going and how to become perfect aspirant for this crucial interview. Apart from coaching classes, studying SSB books and gathering information from several resources, there are still many important aspects, you need to consider in this preparation phase. Actually, most of the candidates study psychological tests and which gives very common answer,which leads to their rejection. Therefore, It's better to improve your personality and reach upto the standards of a Defence Officer. these qualities in you decides what kind of personality you are having till the day and what will you be like in future. 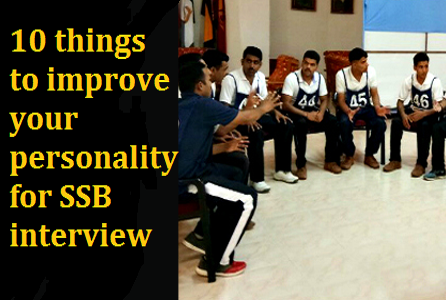 so in SSB Interview officers will assess you by different means. You have done useful things in your life in a good way and now you are having same qualities then you would be a officer they want to see in you. How do you think that makes you different from other candidates and will increase the chance of your selection. Always be positive. think about success not of failure. Beware of negative environment. Positive things happen to positive people. write down your specific goals and develop a plan to reach them. Without Goals you will be like kite with no strings. Goals are those concrete,measurable stepping of achievement that track your progress towards your dreams. Goals are nothing without action. Once you decided upon your goals then start putting your efforts to achieve it. This will make you determinant and doer. Be like nike " Just do it". Becoming a lifelong learner would benefit you all the time. whether your tackling GD fish market to your life duties. Success is a marathon, not a sprint. Never give up and never hesitate to do difficult tasks. Get all the facts, all the input. learn from your mistakes. Spend time gathering details, introspect yourself and put more efforts next time. Don't let other people or things distract you. Remain laser focused on your goals and surround yourself with positive people that believe in you. Be different from others, as different people have different thoughts of doing a single task in different ways, following the herd is a sure way to mediocrity. Learn to understand and motivate others. As Successful people develop and nurture a network and they only do that by treating people openly, fairly and firmly. Take responsibility on Honest platforms, that is what a defence job is.